At ITER, even the opening of a box takes on a spectacular dimension. The operation requires a powerful crane, a full team of specialists and, as everything ITER, the utmost care and precision. A ''box-opening'' operation took place last week at the entrance of the ITER site where large components are stored. 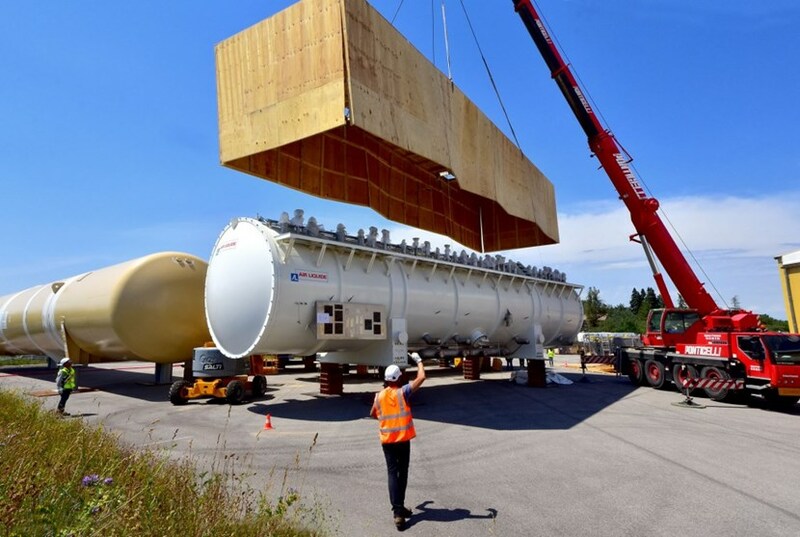 Three large elements of the liquid helium plant (''cold boxes'') were uncovered to prepare for their transport and installation in the ITER cryoplant. The box-opening operation that unfolded on 13-14 June gave access to cryoplant equipment that had been sitting for several months in temporary storage—three 135-tonne "refrigerators" ("cold boxes") and their corresponding "warm panels." But instead of removing the components from the boxes, the boxes were removed from the components—an operation that consisted in lifting the box tops (heavy wooden crates actually) that had served to protect the components during transport and storage. 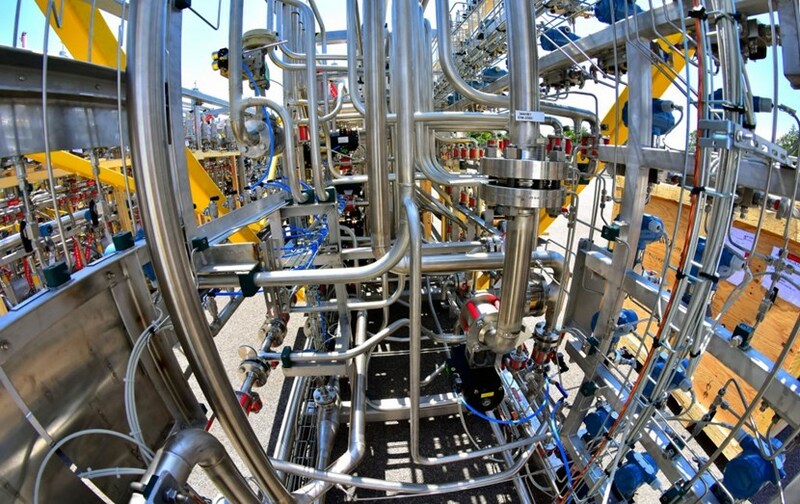 Manufactured by the French company Air Liquide, the cold boxes contain the heat exchangers, turbines, valves, and filters that will cool and liquefy the large volumes of helium needed by cryogenic "clients" in the Tokamak Building (the magnets, thermal shield and cryopumps). Composed of a complex arrangement of pipes, plugs, expansion valves, pressure and flow sensors, the role of the ''warm panels'' is to monitor and protect the processes inside the cold boxes. Gaseous helium enters a cold box at ambient temperature and comes out in liquid form at 4.5 K (minus 269 °C). All the processes that take place inside of the cold boxes are implemented under vacuum, in order to limit thermal exchange with the environment, and all components are wrapped in multilayer insulation blankets to protect from heat radiation. To each cold box a "warm panel" is connected. Composed of a complex arrangement of pipes, plugs, expansion valves, pressure and flow sensors, its role is to monitor and protect the processes inside the cold boxes. Now that they are free from their casing, the three cold boxes and their corresponding warm panels will be loaded on trailers to travel a few hundred metres to the ITER platform along the heavy haul road. Once delivered to the cryoplant, they will be installed in the Cold Box Building, validating yet another ITER Council milestone*. *A set of high-level schedule milestones has been proposed by the ITER Organization to the ITER Council as a way to measure and monitor project progress. "Start of work inside the cryoplant" was an ITER Council milestone scheduled for achievement before the end of Q2 2017.